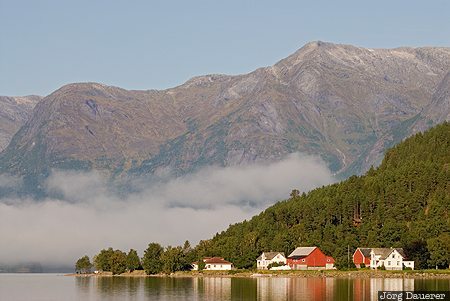 Morning fog over Strynevatnet with the surrounding mountains illuminated by the first light of the day seen from Hjelle. Strynevatnet is in Sogn og Fjordane in central Norway. This photo was taken in the morning of a sunny day in September of 2010. This photo is part of the exhibition Urban Fog (October 2018). This photo was taken with a digital camera.